If labels are printing horizontally offset, try the solutions in this article: Labels are printing horizontally offset (left to right). The image is printing too far to the left or right. The LX800-810 decides where to start printing by detecting the start of the die-cut label, detecting a black mark on the back, or detecting a thru-hole that corresponds to the start of the label. To calibrate the label sensor for die-cut labels, you must separate the first label (or first 5 inches of the label) from the label backing before you load the label stock into the printer. Now feed the label stock into the printer. This allows the LX800 to differentiate between the backing and the printable area. 1. Label Stock Loading. The label stock is not loaded properly. See this article for loading tips. 2. TOF Offset. 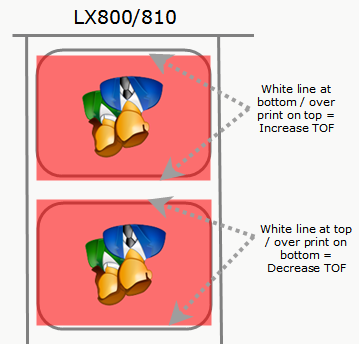 TOF stands for Top of Form and this setting allows you to fine tune the alignment of your printing on your label stock. This will be factory calibrated. If fine tuning is needed, increase this setting to move the image down on the label; decrease this setting to move the image up on the label. The unit of measure is 0.1mm. To access go to Start - Control Panel - Printers and Faxes - Right click "Color Label Printer" - Choose Printing Preferences - Select TOF and TearOff Offsets. See image below for graphical example. 3. Preprinted Stock. Preprinted stock is not recommended for the LX800. See this article for possible remedies. 4. Nonstandard / Non-translucent Backing Material. Test the unit with the label sample material that came with the unit. If it prints correctly, your label stock may not be compatible. The label sensor needs to see the difference between a label and a backing material by seeing through the label stock for light variations. If it cannot see through the label, problems will arise. If you must use this type of backing, try label stock that has a black mark on the back to show where the label begins. You will need to change the Sensor Type setting in the driver preferences to Reflective. 5. Improper Label Gap Distance. See the label specifications article for information about the proper size of a gap. 6. Page Size is Bigger than Label Stock Size. If the page size set in the driver is larger than the actual label stock, ink will be printed on the gaps and the sensor will start looking for a gap too late. This can cause label skipping or inconsistent print starting points. 7. Portrait / Landscape. If the Letter / Landscape setting does not correspond to the label stock installed this will also cause the printer to print over the gap and onto the next label. Make sure this is set correctly. See this article. 8. Sensor Position. Circular, nonstandard label shapes or multiple labels across will require precise adjustment of the label sensor. If you are using circular or other non rectangular die-cut labels make sure the sensor is set to the very top of the label where the shapes are closest together. If the sensor is too far to the right or the left the printer will still sense the label but the image may be offset downward because the printer will start printing at the wrong position. If you are using stock that has multiple labels across make sure the sensor corresponds to a place on the stock that has a label and not a vertical gap. The sensor can be adjusted using the slide bar on the inside of the printer. Below the slide bar is a measurement which represents the distance between the edge of the label stock and the sensor. Measure the distance from the edge of the label stock to the correct position on the stock. Set the sensor to this measurement. Images of the sensor are shown in this article. Labels are printing horizontally offset (left to right). The image is printing too far to the left or right. Bar codes are printing with variable line width. Part of the bar code prints with thicker lines.